If the sun is shining, there’s free power. In this case, it’s thermal energy. You can use that thermal energy to heat water for hot water in your house or for radiant floor heat to keep you comfortable during the winter. These panels are light-weight but efficient. Holding less than a gallon of liquid each, they can be mounted on a roof or in the yard. 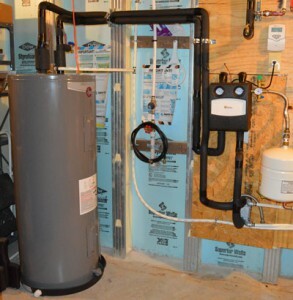 Using a solar-rated storage tank and digital controls, the solar water heating controls keep the solar-heated water at the same temperature you would normally have in a gas or electric water heater. The controls sense the temperature of the liquid in the pipes at four different points and circulate the water as needed to reach the desired temperature. Sustainable Solutions of North Georgia is the Georgia dealer for SunEarth thermal panels, one of the top solar product manufacturers in the country. If you’re interested in solar water heating, contact us and start using the sun’s free energy.